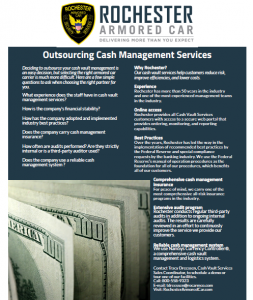 Deciding to outsource your cash vault management is an easy decision, but selecting the right armored car carrier is much more difficult. Here are a few simple questions to ask when choosing the right partner for you. How often are audits performed? Are they strictly internal or is a third party auditor used? Does the company use a reliable cash management system? Request our guide to Outsourcing Cash Management Services today.